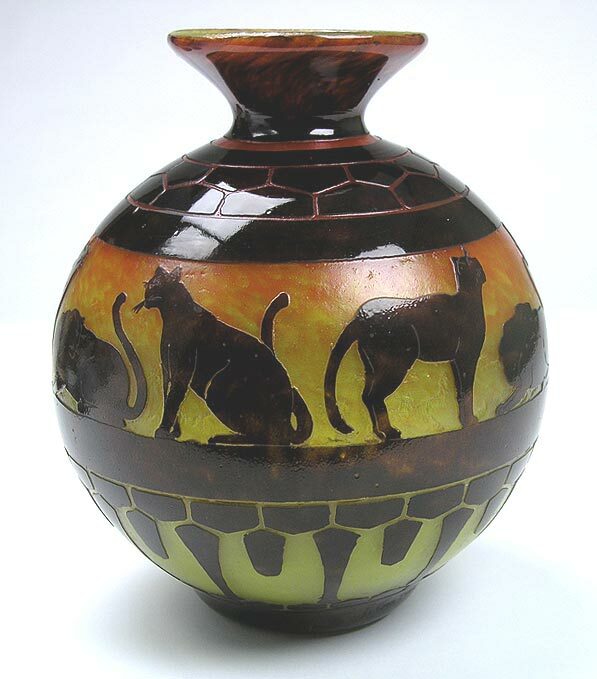 Among the best Le Verre Francais vases are ones with animals. 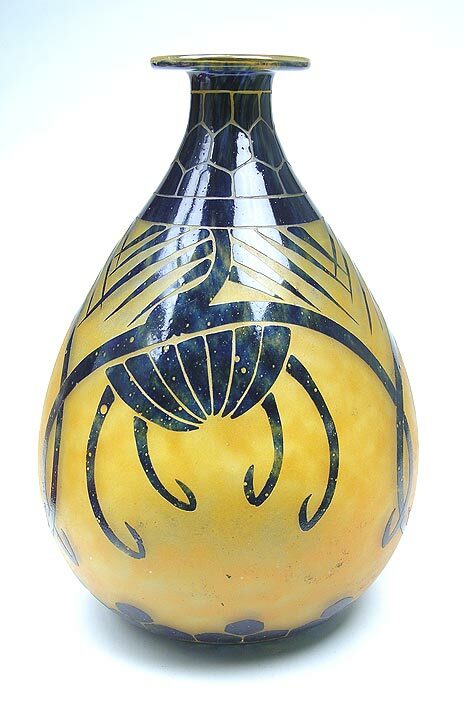 This lovely example has snails and is referred to in French as Escargots. 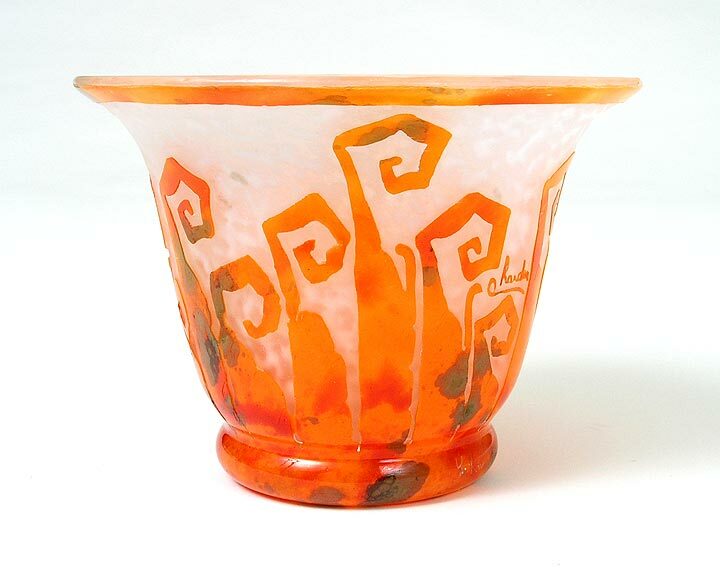 It has very good color and contrast and is nicely sized at 9½". 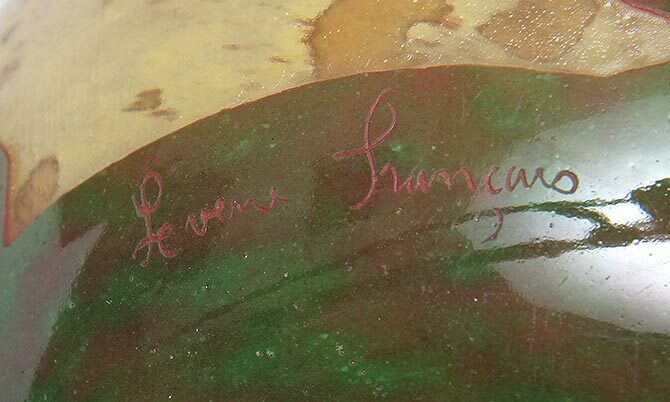 Signed "Le Verre Francais" on the foot. Mint condition. 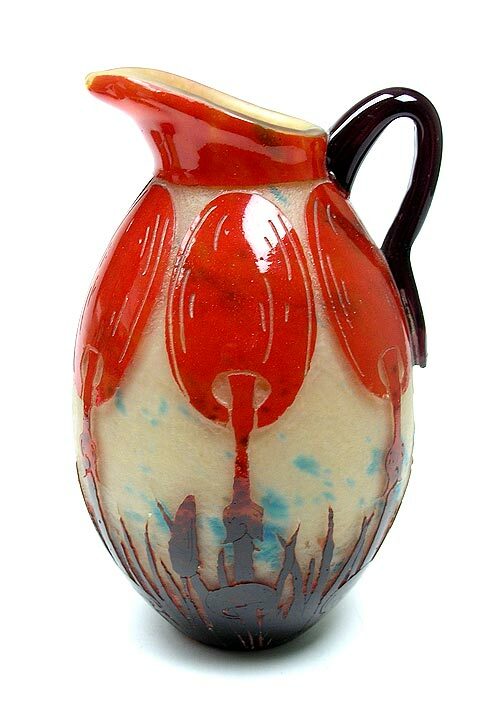 This is a wonderful example of a Le Verre Francais pitcher. 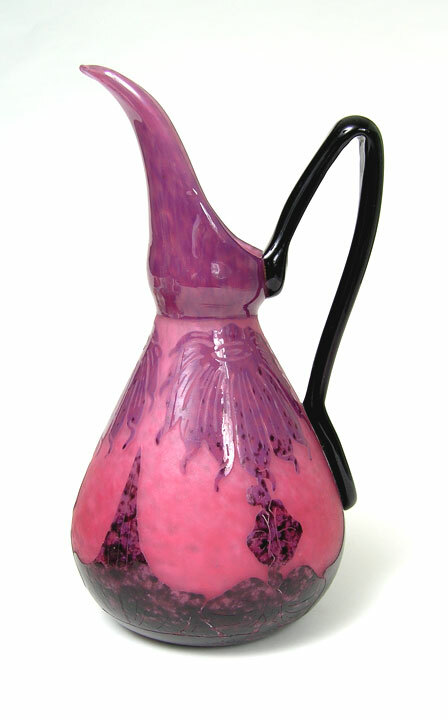 The shape is standard for Le Verre, but it's special, nonetheless, because of the great applied snake handle. 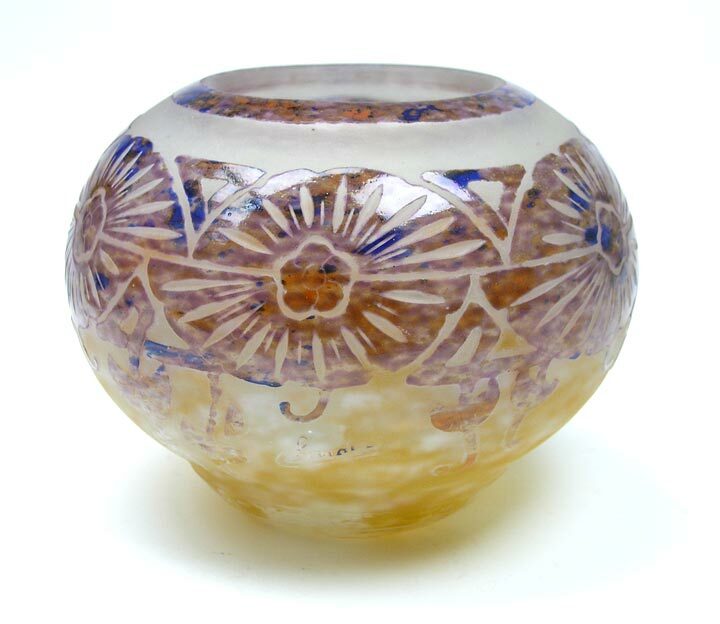 The design is moderately rare and is known as Spirales. 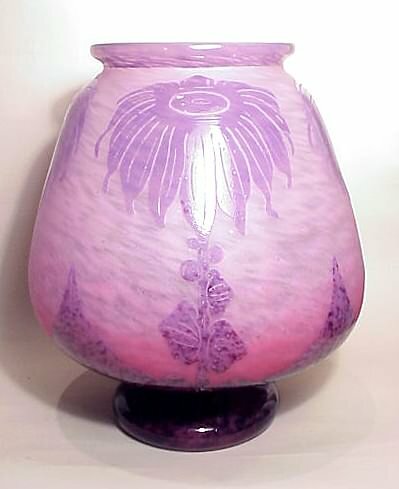 Nice size at 12½" tall. 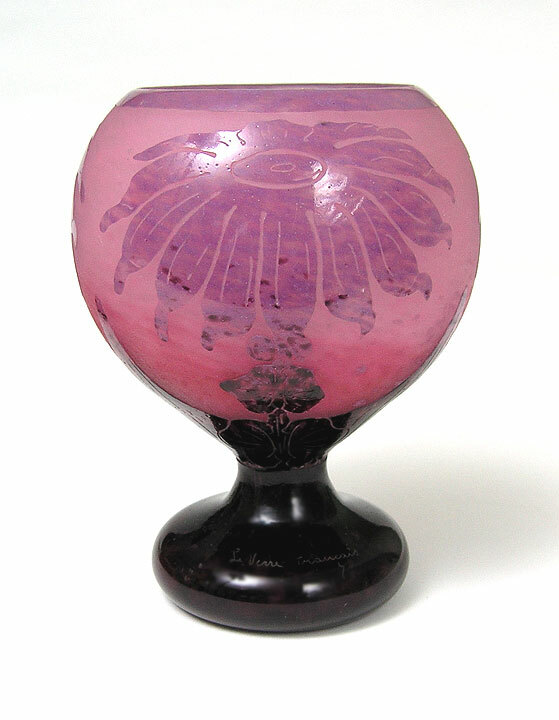 Red-rubbed, acid-etched signature, near the foot rim. Mint condition. 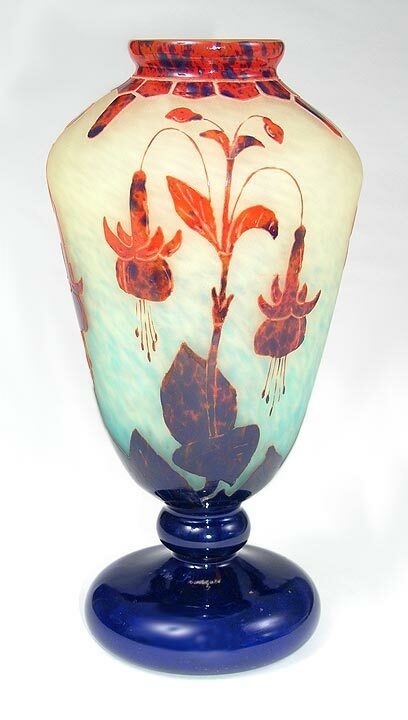 What's so nice about this example of Le Verre Francais Daturas (angel's trumpets) pattern is the color. It's vivid, with a lot of pink (one of the best colors you can ask for). 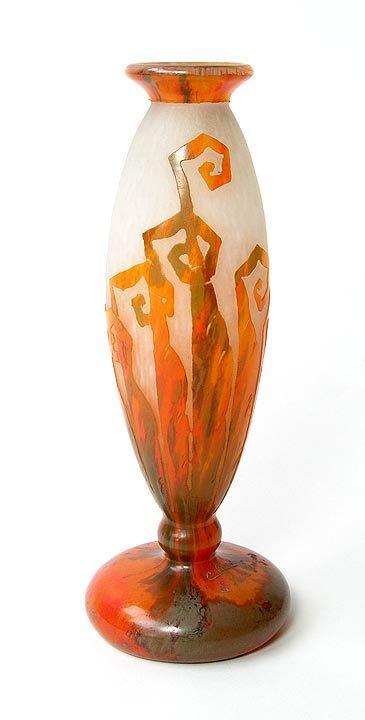 The shape is graceful and the size is wonderful at 16" tall. Signed. Mint condition. 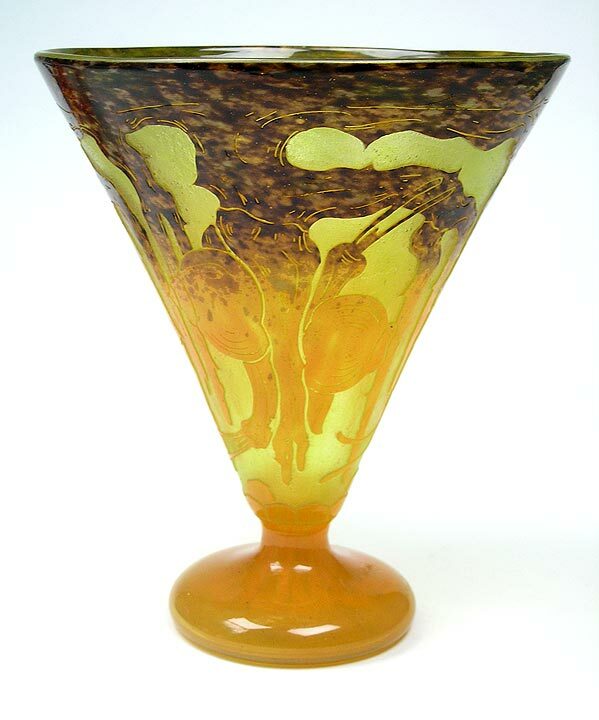 Another lovely example of Le Verre Francais Daturas (angel's trumpets) pattern. Vivid color with a lot of pink (one of the best colors you can ask for). 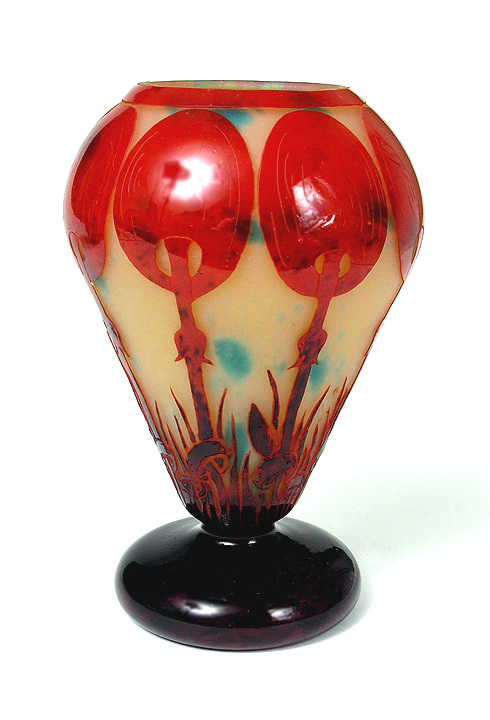 Petite vase at 6½" tall. Signed. Mint condition. I haven't owned this moderately rare pattern before. 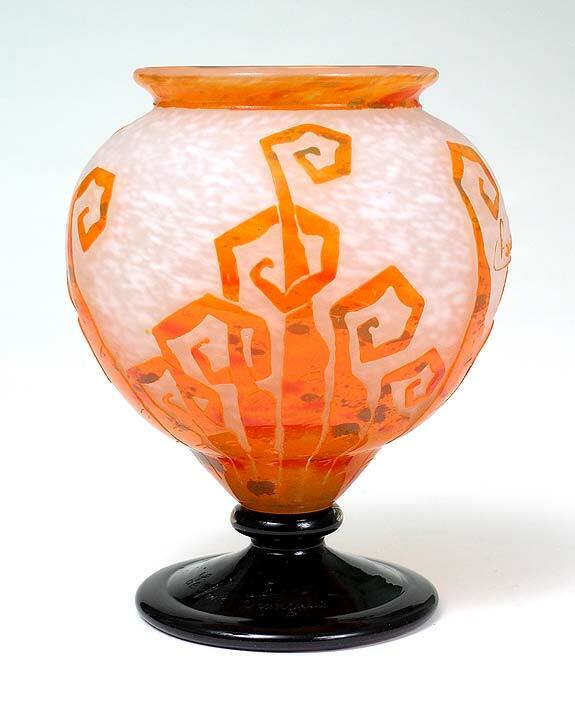 This is a beautiful example with bright coloration and a nice size at 11½". Signed. Mint condition. Animals of any kind are very desirable subject matter for Le Verre Francais. 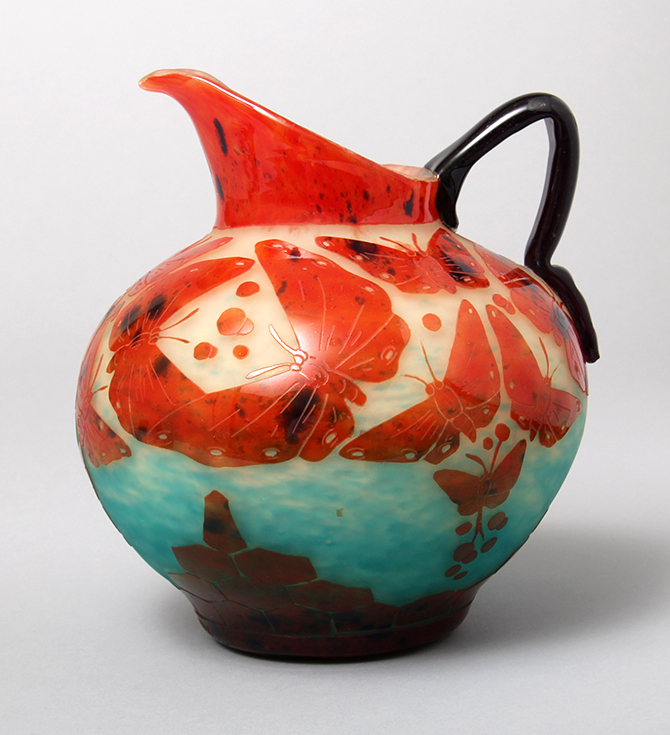 This Papillons example with butterflies, has stunning color, but also an applied handle. 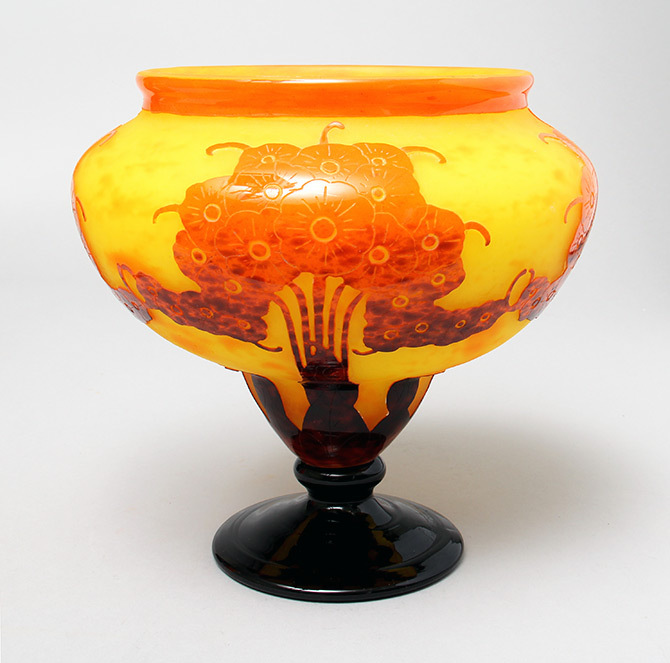 Nice size at 8" tall and bulbous. Signed. Mint condition. 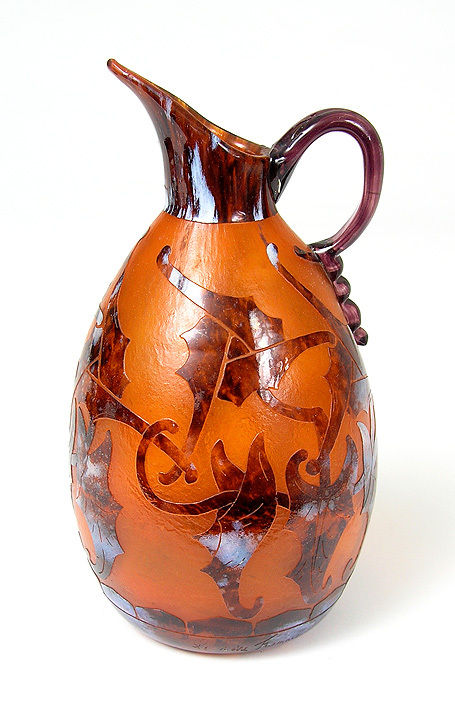 Primerolles is a decoration I've never owned before, which makes it slightly rare. The color is vivid and the contrast is excellent. 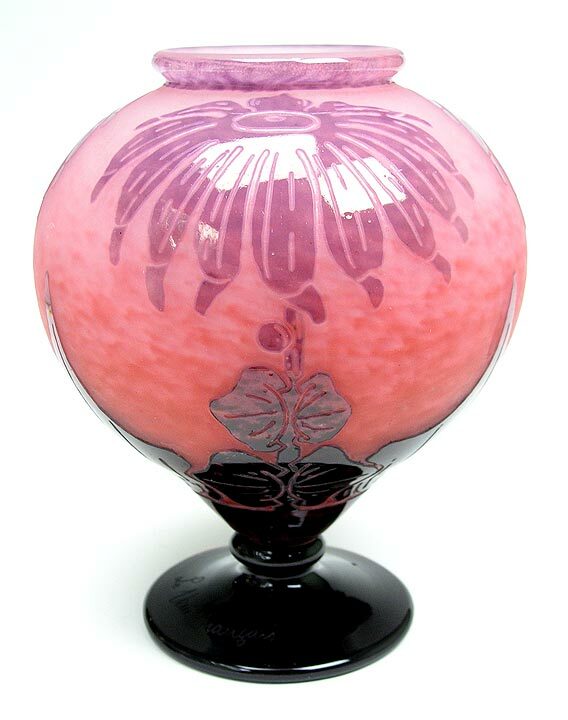 Couple that with a desirable shape and you have a lovely vase. Nice size at 8¾" tall. Signed. Mint condition. Nice color, nice form. 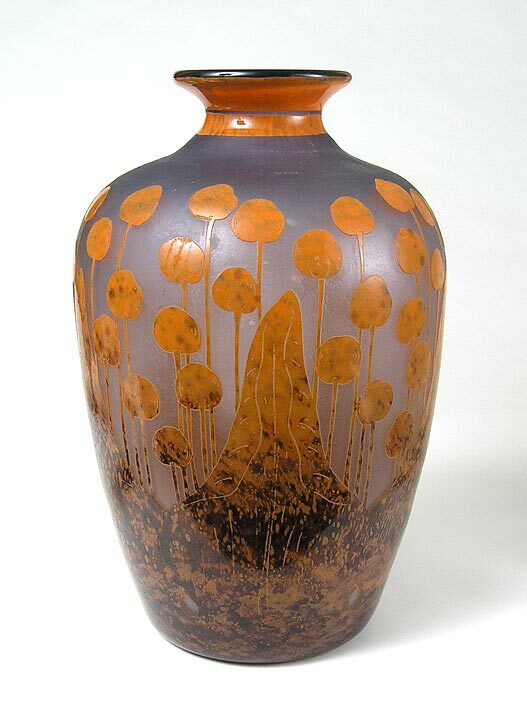 Just a lovely vase. 7" tall. Signed. Mint condition. 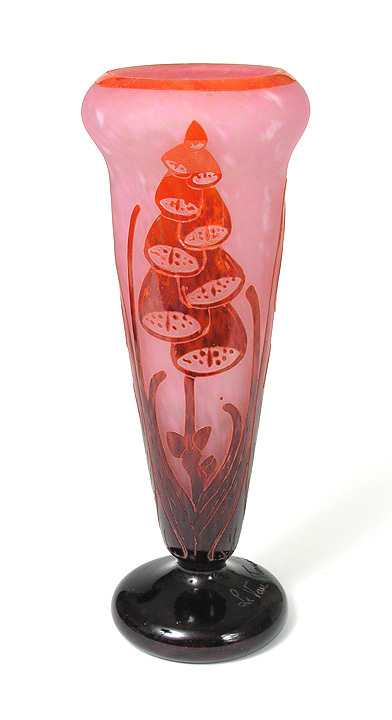 The Bégonias decoration comes in different color combinations. This variation is the most colorful with great contrast. 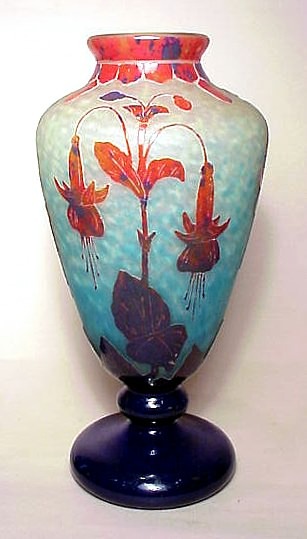 Another interesting variation is that the deep blue glass at the top is matte finish, then becoming glossy below. 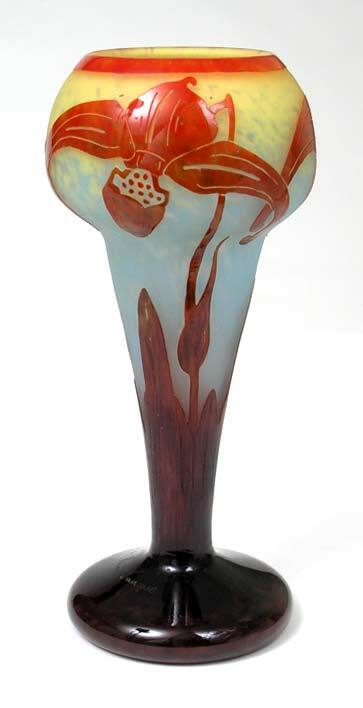 The decorated stem is another very nice touch. All in all, a very handsome example. Nice size at 11¼". Signed. Mint condition. 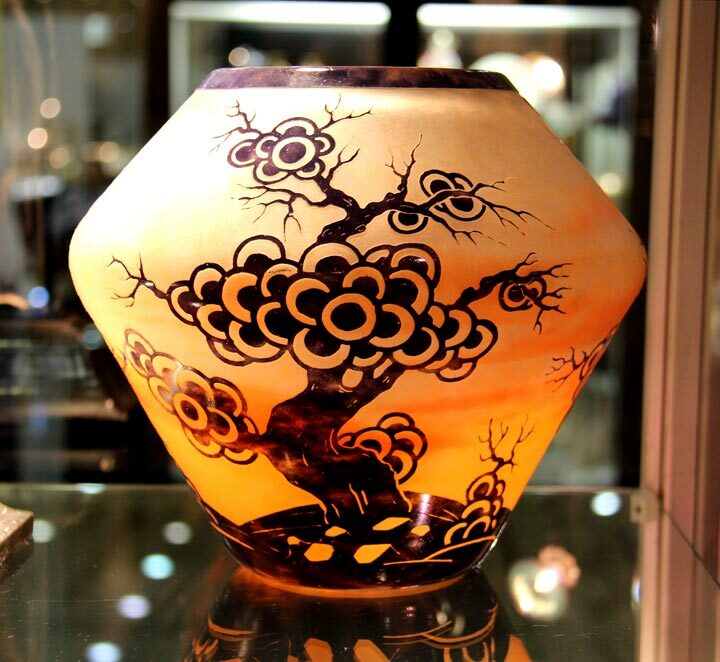 The Le Verre Francais Bonsaï tree vase is so rare that this is the first time I've owned one in 40 years. 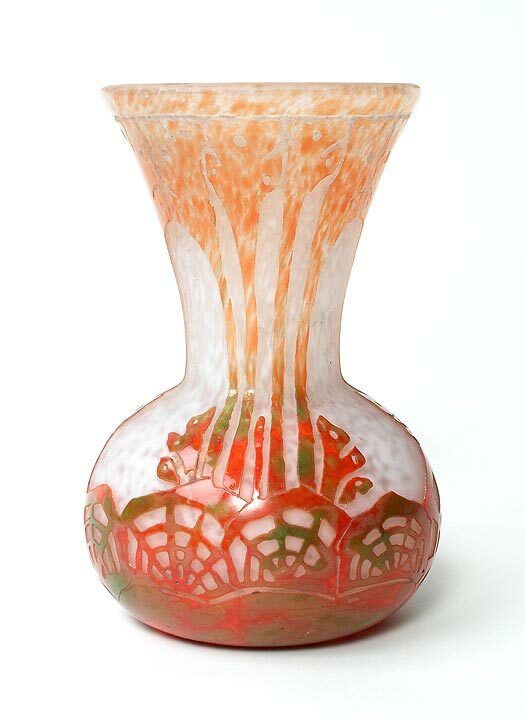 This is all you can ask for in Le Verre -- rare decoration, great color, good shape and big size at 8¼" tall x 9" diameter. Signed. Mint condition. The Cerises pattern is moderately rare. 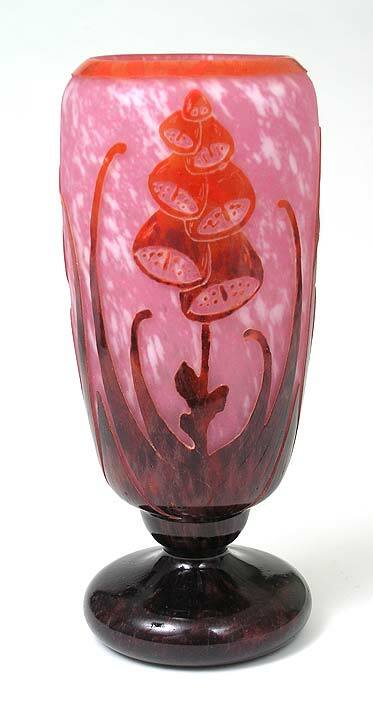 This fine example is monumental in size, 17" tall and bulbous. It's hard to find examples that are both this high quality and this size. Signed. Mint condition. 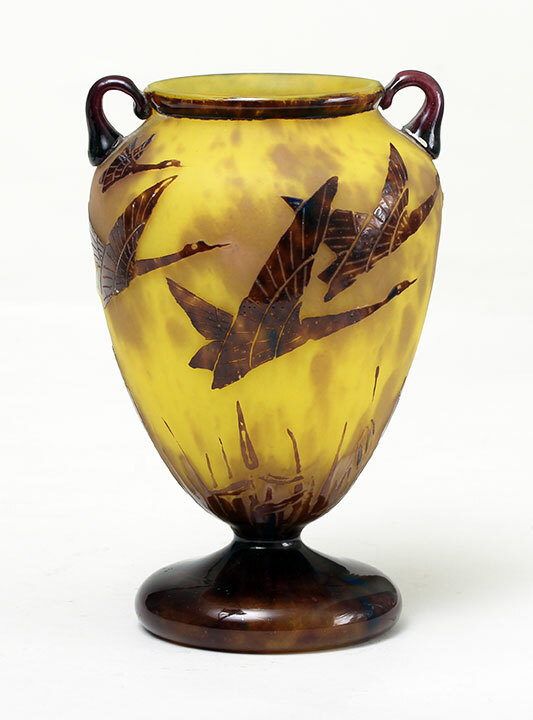 This lovely vase is quintessential Le Verre, with beautiful earth tones. Nice size at 12¼". Signed. Mint contion. 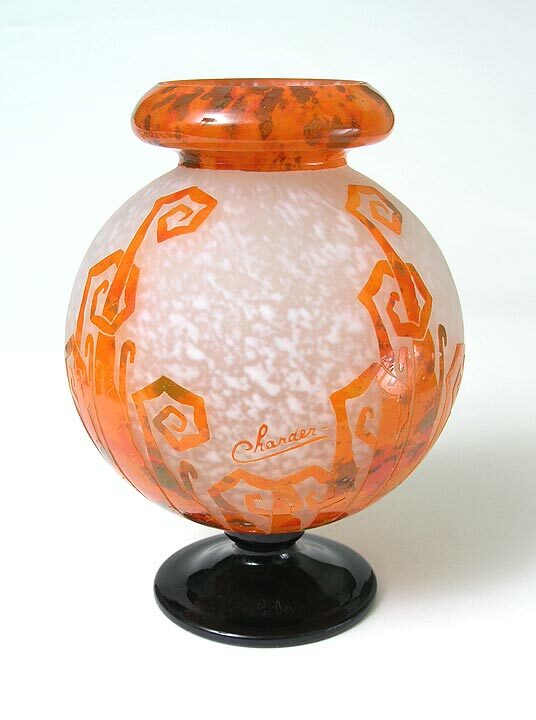 This Le Verre Francais night light has a dual function -- it is both a night light and a perfume burner. In the top, there is a well to add perfume. As the bulb warms the glass, the perfume evaporates into the room. 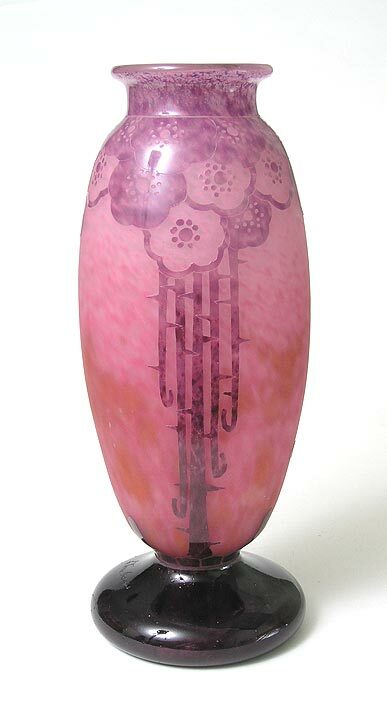 The design is lovely, in the somewhat rare Cocotiers pattern. The original wrought iron base has been professionally rewired for American electricity. Signed. Mint condition. 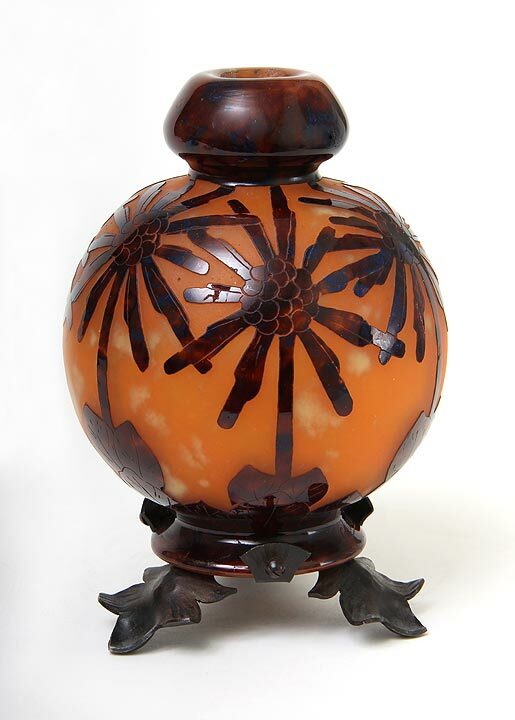 Lovely example of the Coprins decoration. 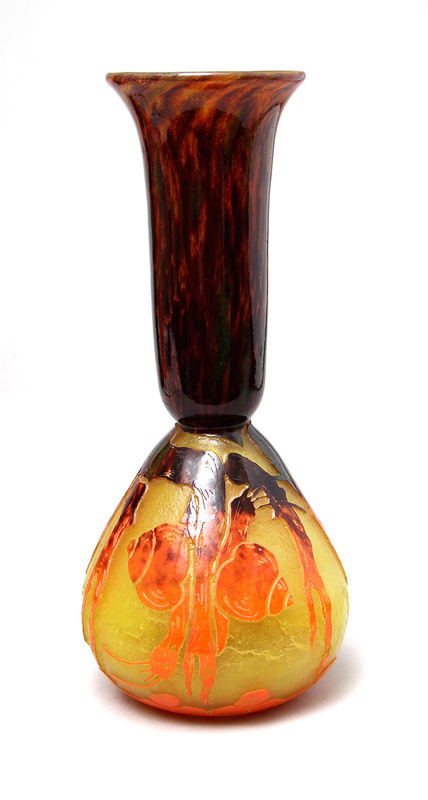 Strong color, great shape and an applied handle. 7 1/2" tall. Signed. Mint condition. 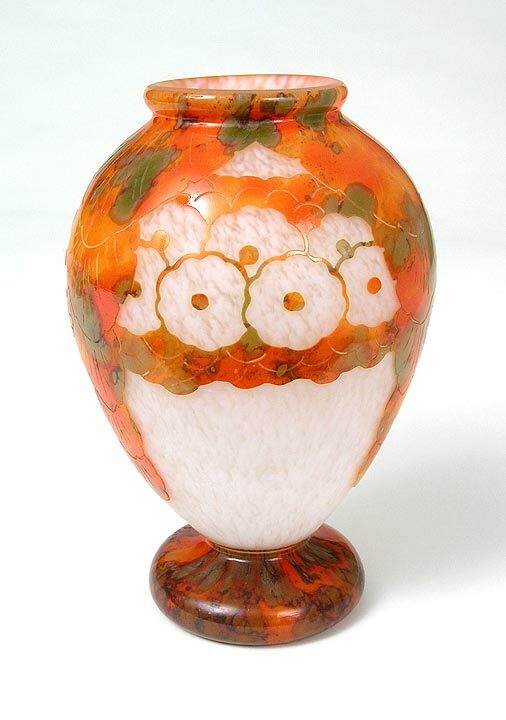 Fine example of the Coprins decoration with excellent color. 7½" tall. Signed. Mint condition. Dahlia is not a rare decoration but the color, quality and shape do vary. This is the best quality, color and shape, especially with the applied foot. Very nice size at 13". Signed. Mint condition. 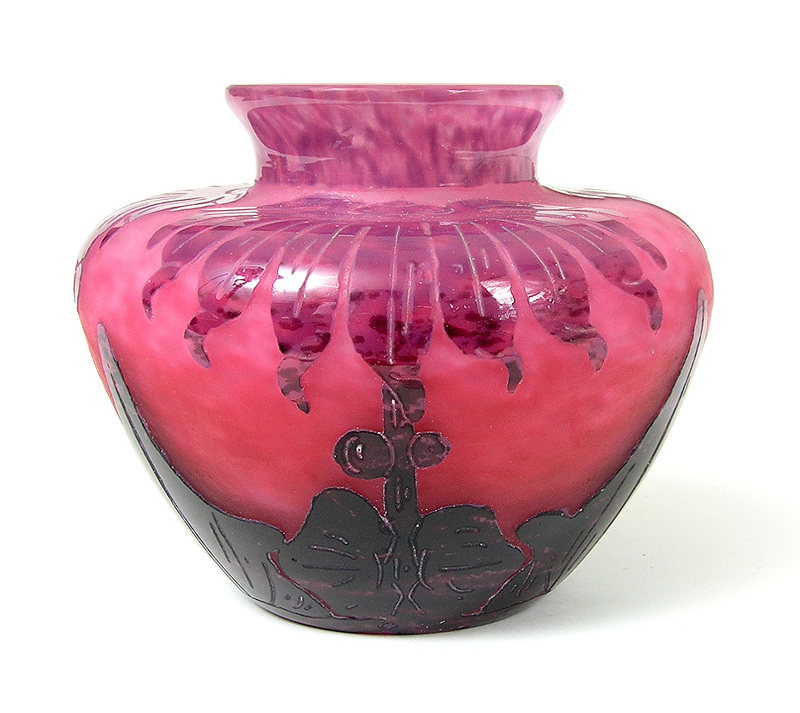 A very pretty Dahlia vase in a diminutive size, 4½". Very good color and nice shape. Signed. Mint condition. 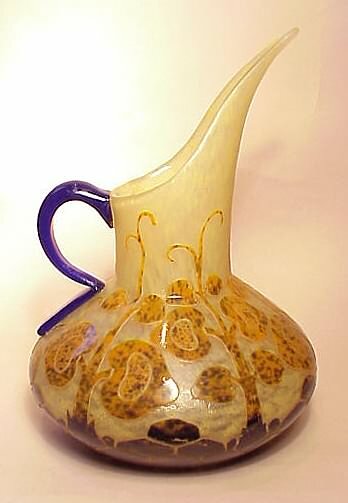 Exceptional example of the Dahlias pattern on a really great shape with very fancy applied snake handle. Nice big size at 13". Signed. Mint condition. 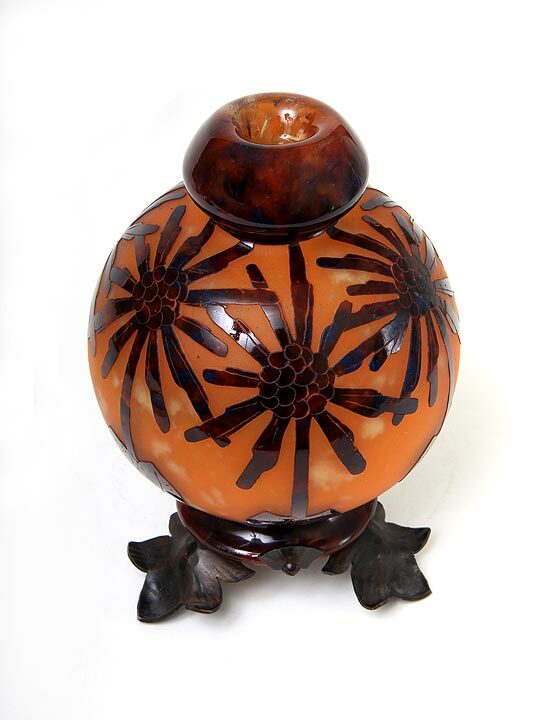 Very nice example of the Dahlias pattern in a diminutive size - 6½". Signed. Mint condition. 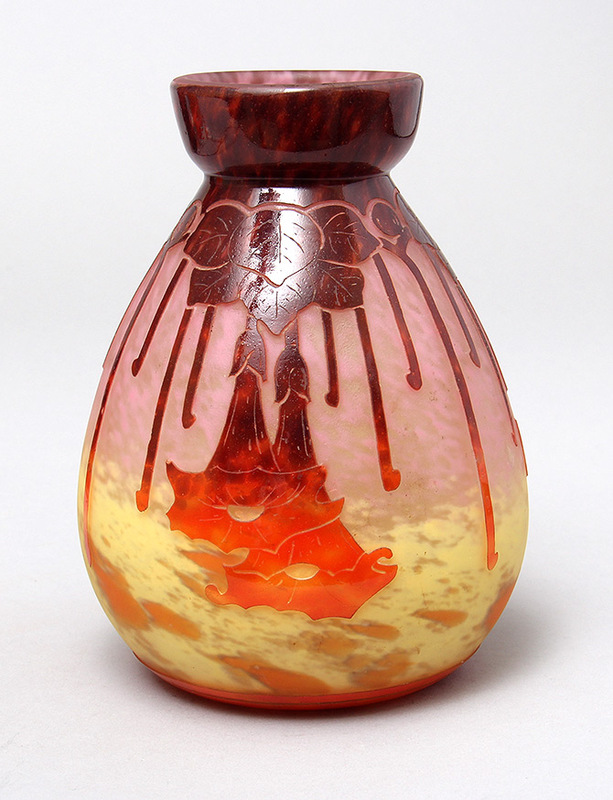 Perfume burners have an indentation in the top for a small amount of perfume. 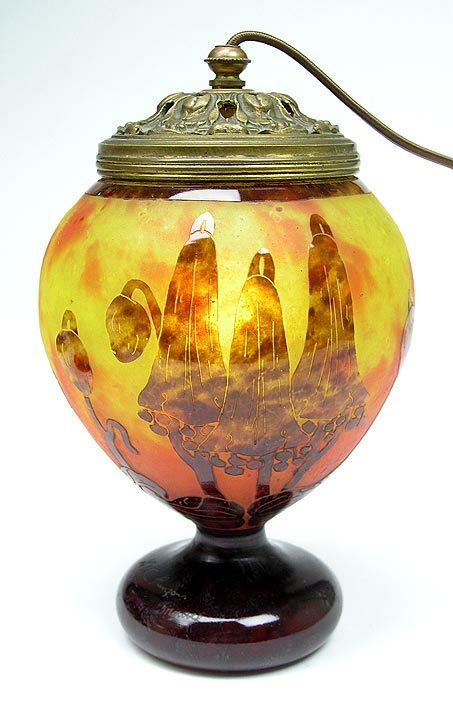 The heat of the light bulb warms the liquid and perfumes the air. At least that's the theory. I wouldn't suggest it. It sounds like the smell would be too strong and something could go wrong. Treat it like a night light, with beautiful color. 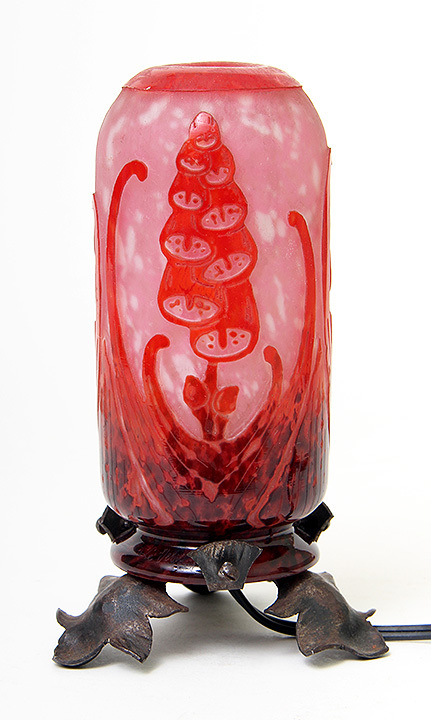 The pattern is Digitales and the color is great. 6¾" tall. Signed. Mint condition. Nice bright color in a good design. Very nice shape and good size at 11¾". Signed. Mint condition. Nice bright color with good pink. 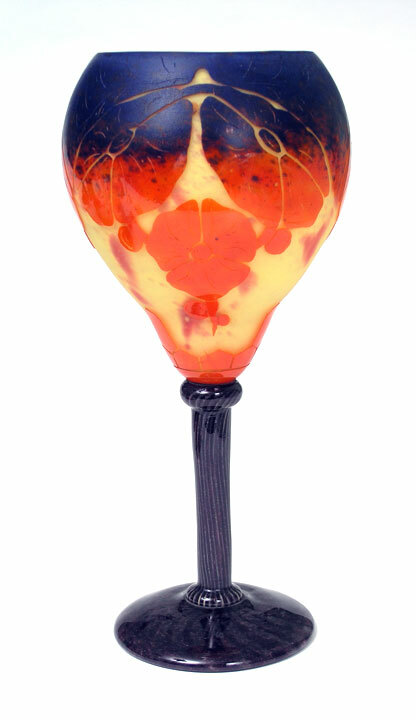 Attractive footed shape and good size at 10¼". Signed. Mint condition. Nice color and size. Signed. Mint condition. 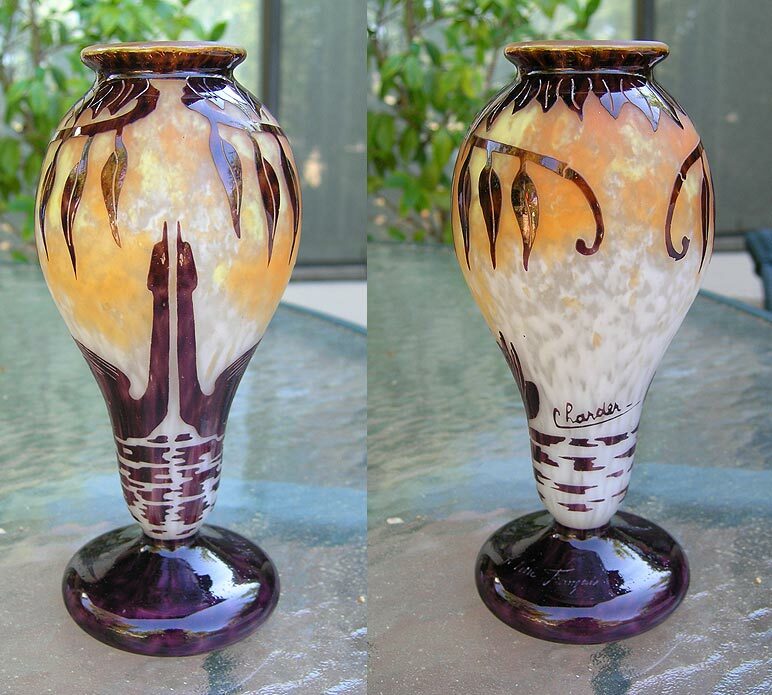 A lovely small vase in the Fougères pattern with excellent color. Very attractively priced. 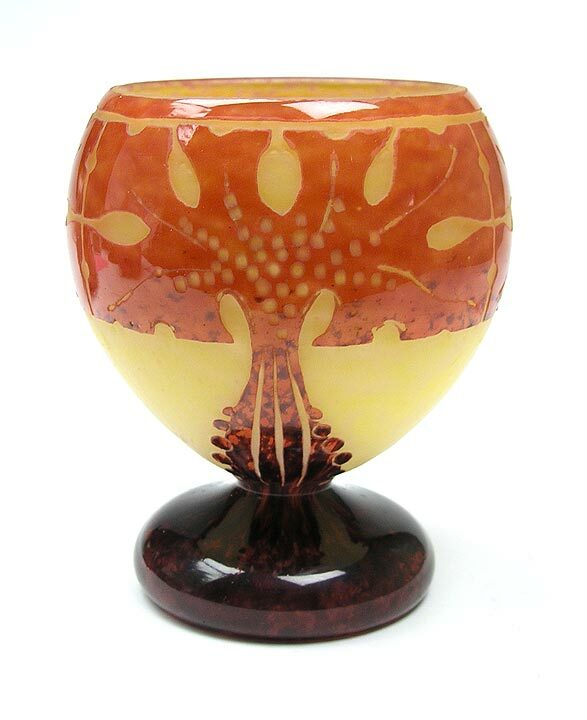 4¼" tall x 6" diameter. Signed both "Charder" and Le Verre Francais". Mint condition. I've always liked Le Verre's Fougères decoration. It's cheerful with fern fronds unfurling. 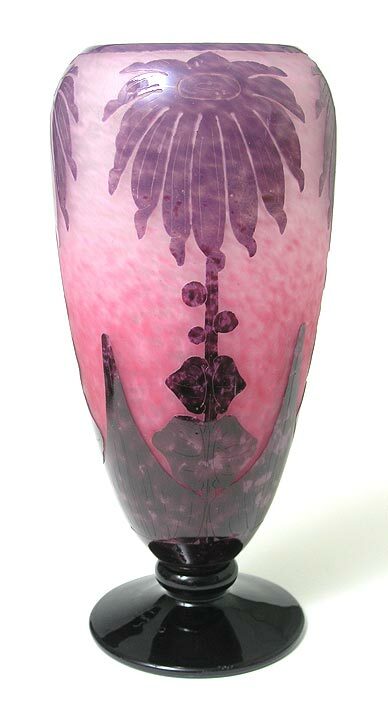 This is a wonderful, bright example with a great shape and an applied foot of deep purple mottled glass, which contrasts beautifully with the body of the vase. 7" tall. Signed. Mint condition. 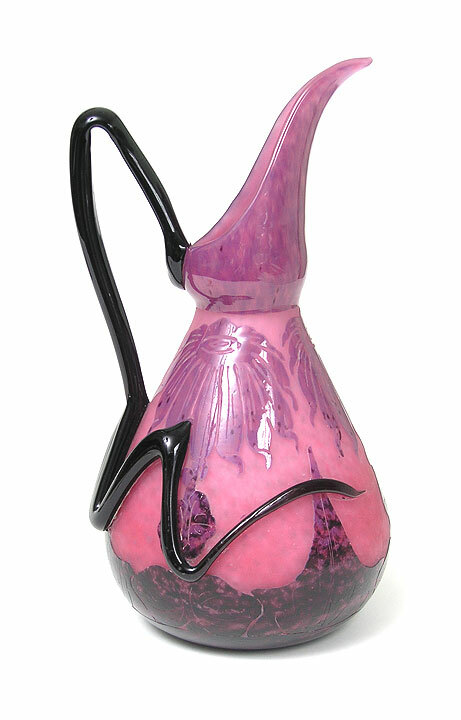 Wonderful shape with beautiful, vivid fuchsia flower decoration. 11½" tall. Signed. Perfect condition. 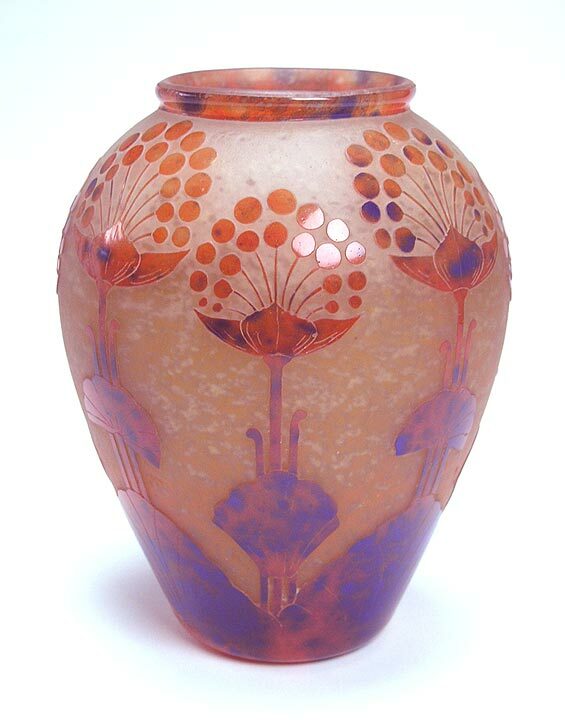 Pretty example in the Glycines pattern -- nice bright colors with excellent mottling and contrast. 8½" tall. Signed. Mint condition. Any animal is good subject matter for Le Verre and geese are no exception. 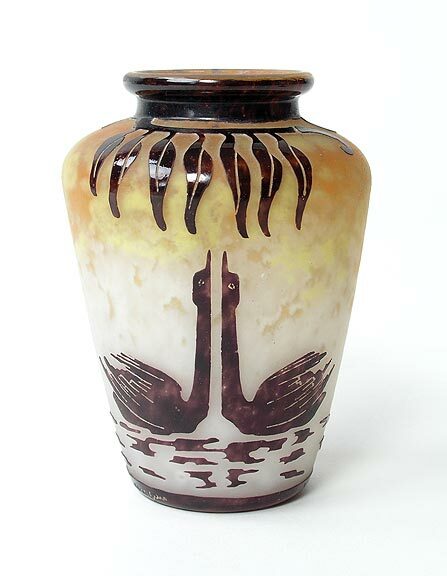 This Halbrans vase with geese is especially nice together with its really good big size at 17½". 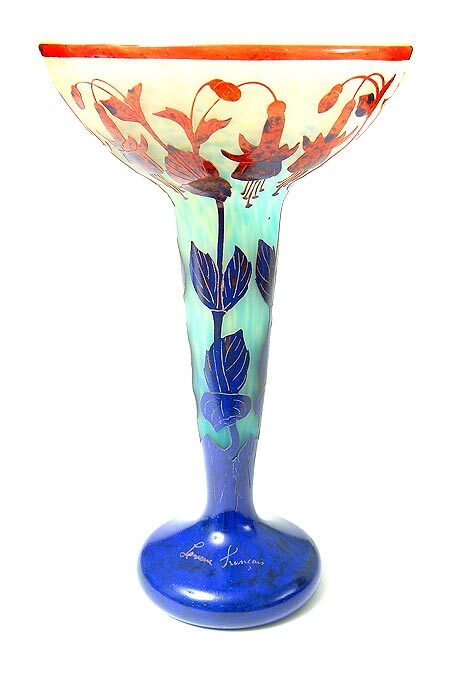 A wonderful addition to any Le Verre collection. Signed. Mint condition. Animals are very desirable in Le Verre Francais. 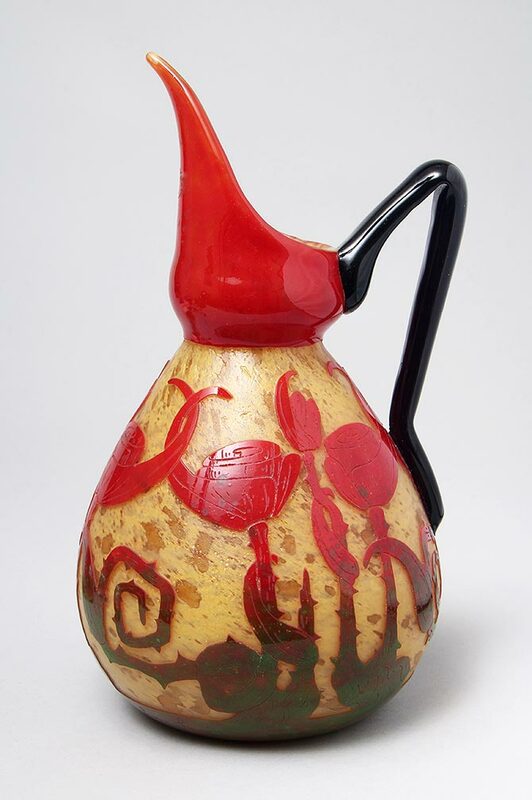 This diminutive example of the Halbrans pattern with geese, is very attractive with two handles. 6" tall. Signed. Mint condition. Very attractively priced. A rare decoration that I haven't owned before. 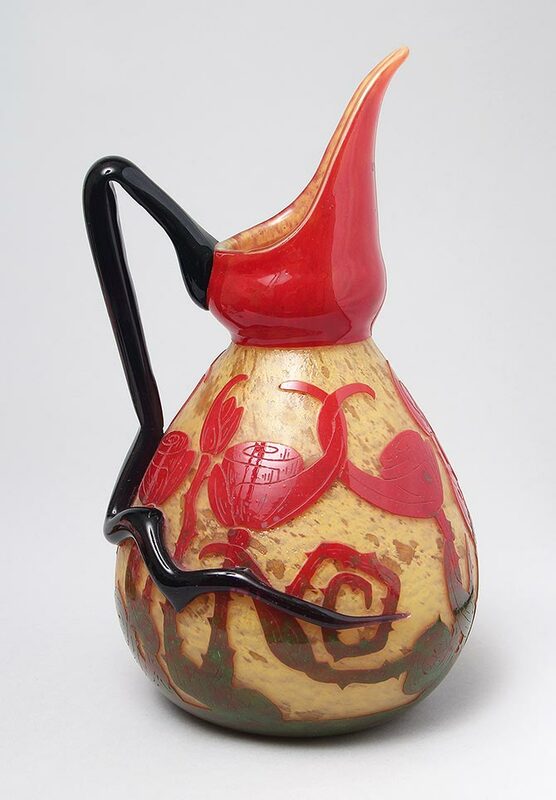 Bright and colorful with a great form and applied handle. 8¼" tall. Signed. Mint condition.